The Asha'man are trained at the Black Tower, a converted farmhouse near Caemlyn. 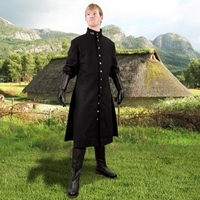 The black coat of this elite guard is made of 100% wool and has a matching rayon lining. Twelve antique silver buttons adorn the front, with two hidden slit pockets on the side. Silver Sword Pin and Dragon Pin sold separately.